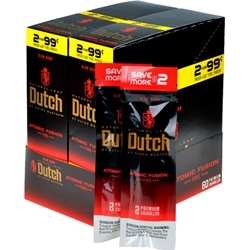 Dutch Masters Cigarillos Atomic Fusion cigars have an inviting blend of exotic tangy fruit flavors. The Cuban-Seed tobacco used for the filler further adds character to the flavor profile of the smoke. The homogenized tobacco leaf used for the binder is covered with a natural wrapper. Available here at Smokers Discounts!